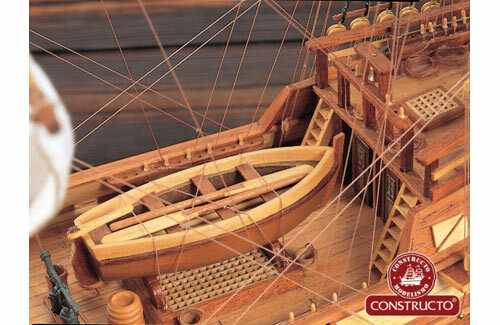 All Products > "80819 Constructo Mayflower 1:65"
The Mayflower was the ship that transported English and Dutch Separatists, a French Huguenot, William Vassall fleeing religious persecution, and other adventurers referred to by the Separatists as "the Strangers" to Plymouth, Massachusetts in 1620. 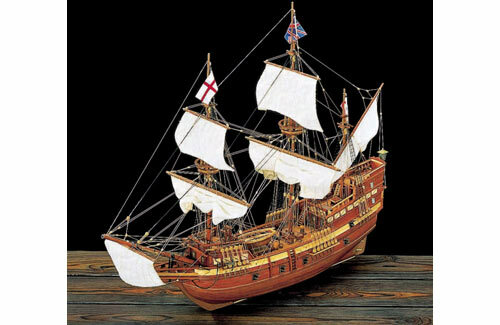 The Mayflower departed Plymouth, England on September 6/16, 1620 with 102 passengers and about 30 crew members in a small 100 foot ship. The first month in the Atlantic, the seas were not severe, but by the second month the ship was being hit by strong North Atlantic winter gales, causing the ship to be badly shaken, with water leaks from structural damage. There were two deaths, but this was just a precursor of what happened after their Cape Cod arrival, when almost half the company would die in the first winter. On November 9/19, 1620, after about 3 months at sea, including a month of delays in England, they spotted land, which was Cape Cod. And after several days of trying to get south to their planned destination of the Colony of Virginia, strong winter seas forced them to return to the harbor at Cape Cod hook, where they anchored on November 11/21. The Mayflower Compact was signed that day. The Mayflower has a famous place in American history as a symbol of early European colonization of the future United States. The main record for the voyage of the Mayflower and the disposition of the Plymouth Colony comes from the letters and journal of William Bradford, who was a guiding force and later the governor of the colony.